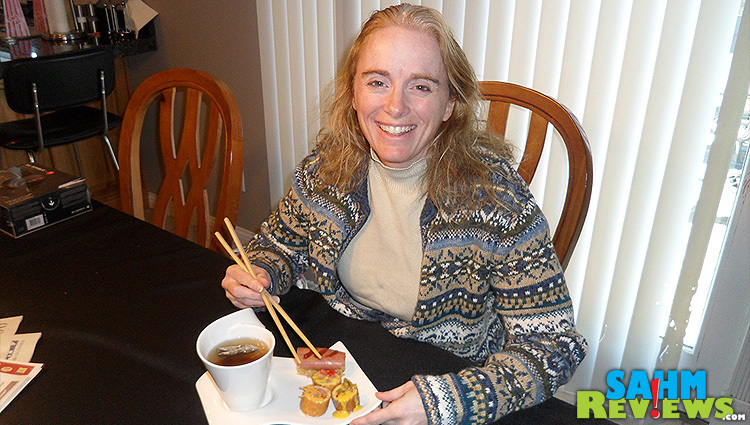 Home / Food / Products / A World First: Sushi Corn Dogs! I think we mentioned before about how we got our kids to enjoy eating fish (well, salmon) very early in life by calling it “orange chicken”. Since they love Chinese food it was an easy sell. Fortunately now that they’re a bit older, they are more willing to try new foods as long as we don’t force them to continue eating something they really don’t like. In fact, I can’t remember the last time we made mac-n-cheese or nuggets. More often than not the special request is some type of oil & vinegar salad or grilled chicken! Sushi probably isn’t something that most kids will try. Fish is a four-letter word to many kids, much less raw fish. One of our daughters has taken to the ‘mild’ sushi at our local buffet (meaning the cooked versions), but the other isn’t much of a fan. She tolerates it, but doesn’t ask for it. But, what if I could ‘train’ her to like it in the same manner that we got her to like salmon?! 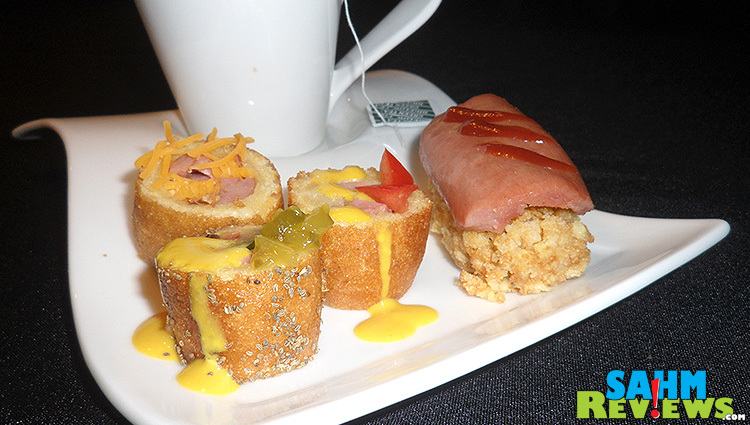 That’s where my world-first idea came from – Corn Dog Sushi! 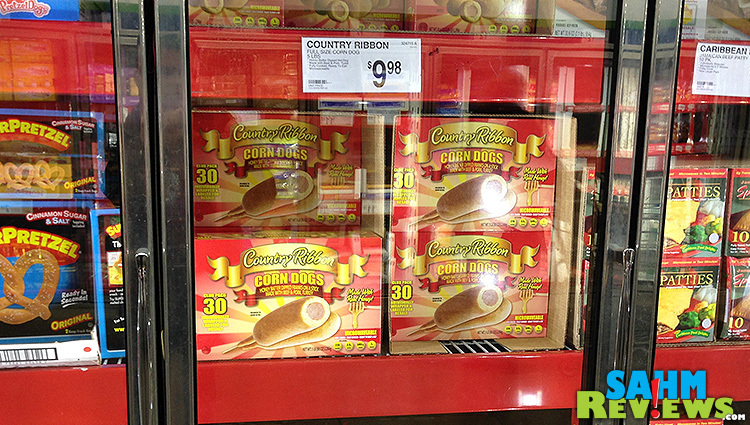 What kid doesn’t enjoy a thick, corn bread covered hot dog on a stick?! If only we could tweak it a little bit to acclimate her to the look of a sushi roll, maybe she wouldn’t be so hesitant about trying them. 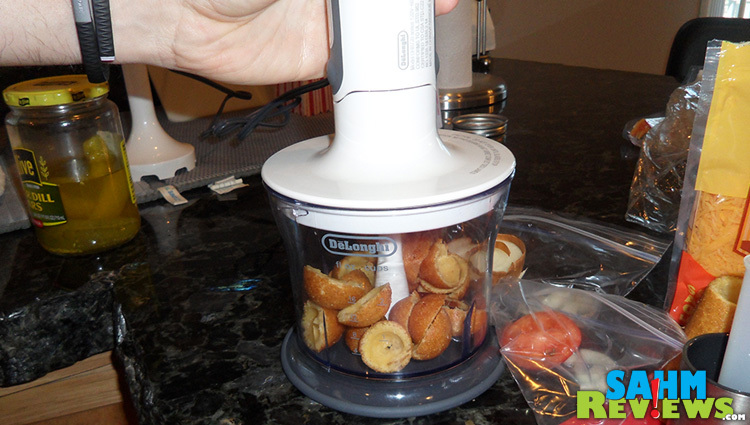 Off to Sam’s Club to pick up a box of frozen corn dogs to experiment with! I have to admit, I spent way too much time figuring this out in my head to make them perfect. I’ll take you through the steps (and recipe) for the first one, and then post a couple more recipes I created. 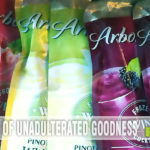 You’ll be amazed with the results, and your guests will be amazed by the taste! 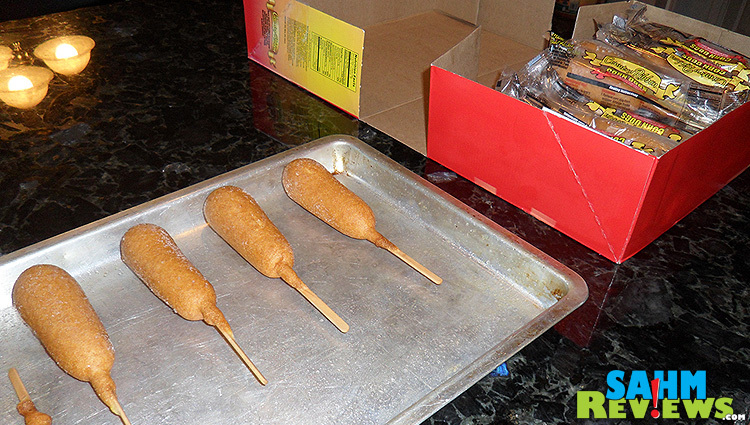 First, I chose to use the baking method for cooking the corn dogs. I wanted the exterior to be firm and I’m sure microwaving would not have given me that result. Deep-frying would probably have worked, but in the interest of keeping calories down, baking was best. With the corn dogs in the oven, it was time to gather all the ingredients we’d need for the project. I know this looks like a lot, but remember, this is for three different recipes, so don’t panic (yet). 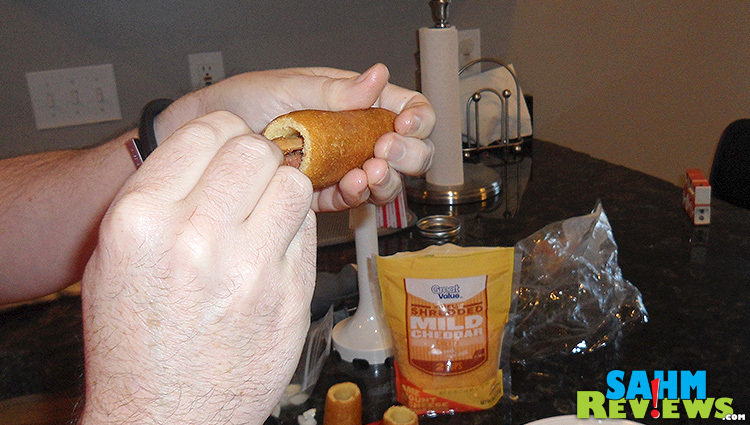 Our next step is to remove the hot dog part of the corn dog from the outer breading. 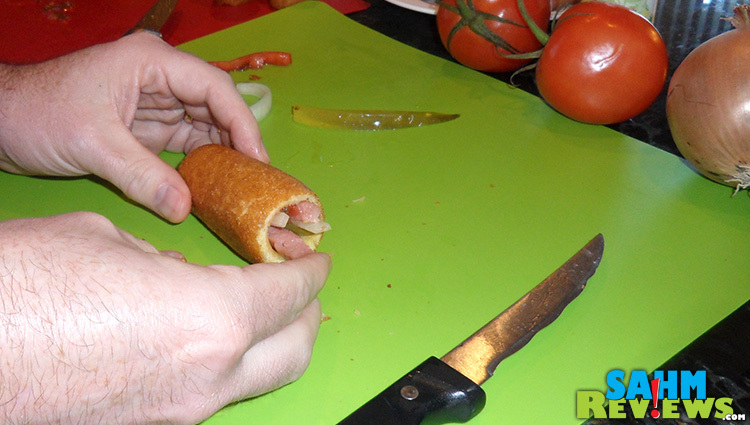 This is accomplished by cutting both ends, removing the stick and pushing the hot dog out of the middle, creating a hollow tube. I’m sure you see where I’m going with this. I’ve never been a proponent of too many toppings on my hot dogs; I’ve always been a ketchup and onions guy. But for this project we’re going all out. 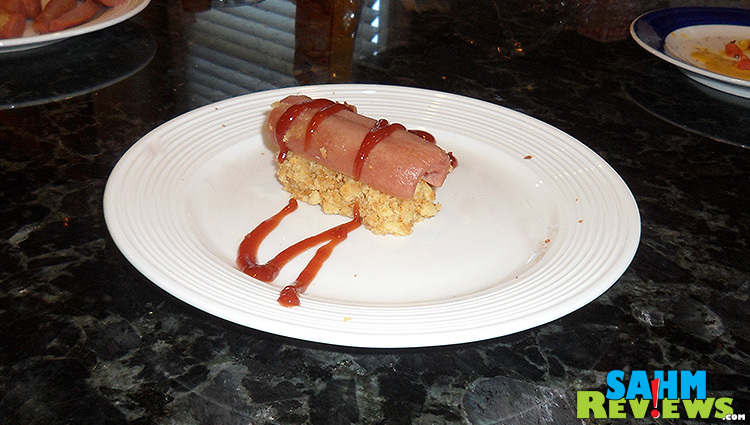 I picked out a couple famous regional recipes for hot dogs and have created a ‘sushi’ version in their likeness. First up, Chicago Style! 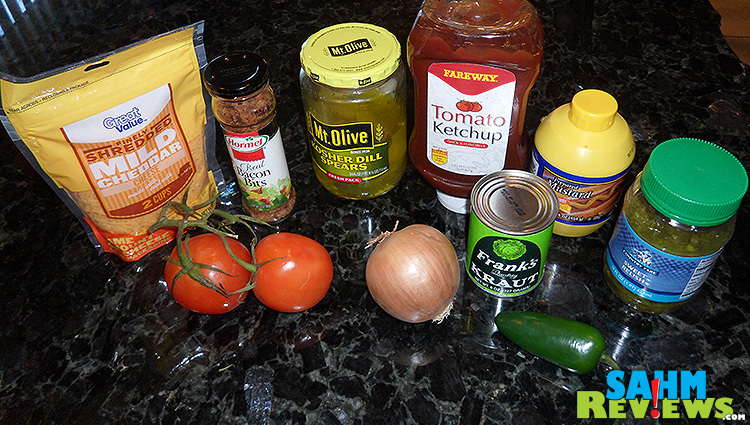 This requires onions, relish, dill pickles, a short pepper, tomatoes and celery or poppy seeds. We’ll only be using half of a hot dog per tube, so I quarter them lengthwise and save the rest. 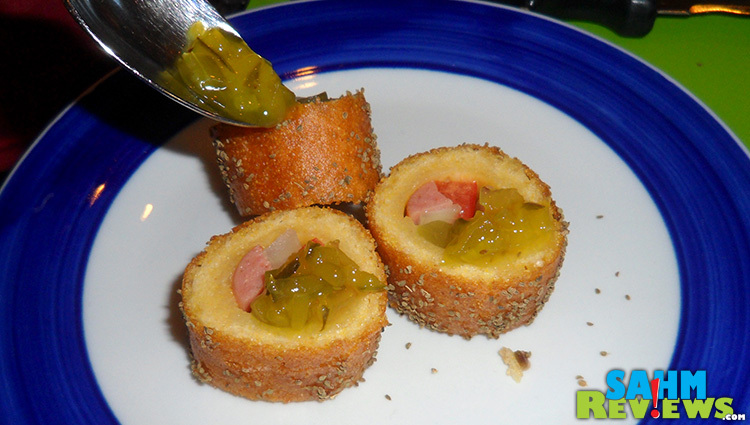 Stuff the hot dog, pickle slice, onion slice, tomato slice and pepper slice into the tube. 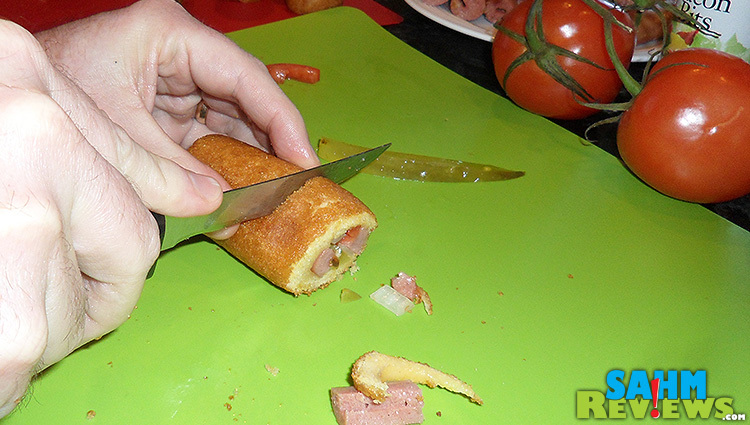 Each corn dog casing will yield three sushi, so trim the ends neatly and then cut into 3 even slices. 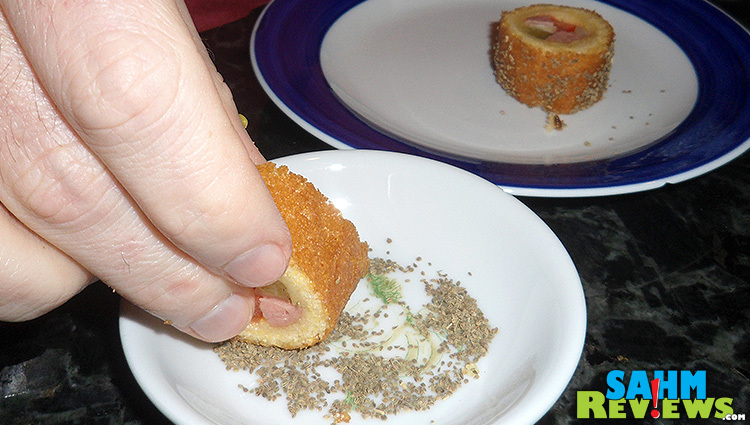 Spray the outside of the roll with some oil, then roll the edges in celery seed or poppy seed. 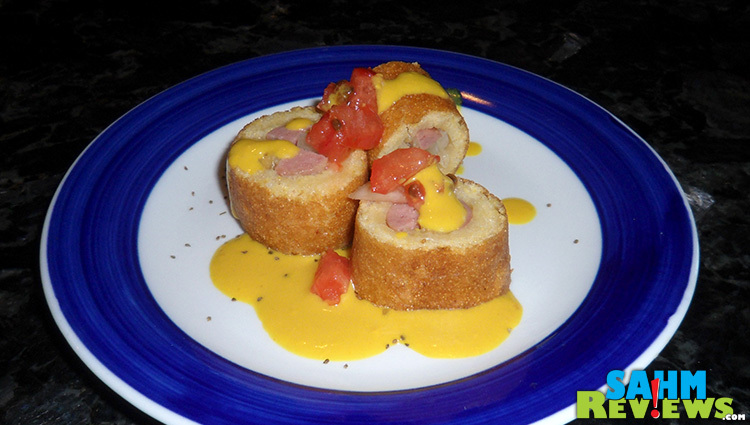 Plate and put a dollop of relish on the top of each roll and drizzle with thinned yellow mustard. And there you have it. 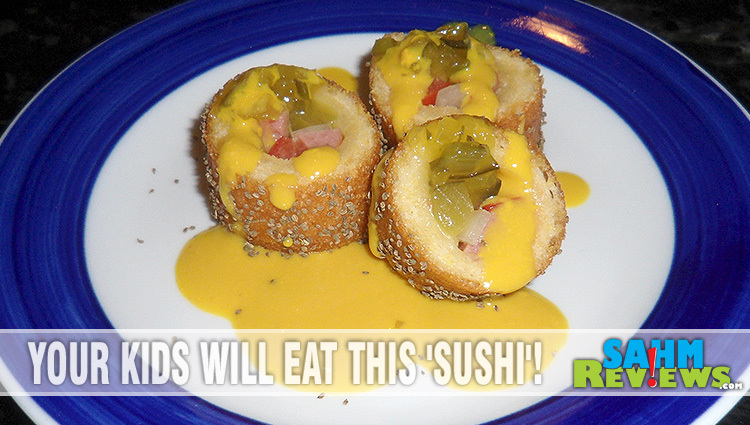 Three perfect Chicago-Style Corn Dog Sushi Rolls! 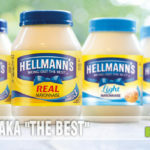 Of course, we can’t let the other famous type of hot dog feel left out. So next are some famous New York style dogs! These are much simpler, requiring only sauerkraut, onions, tomatoes and mustard. The hard part is getting the sauerkraut into the tube. Good thing I kept some of the corn dog sticks lying around! Viola! A little tomato garnish and the thinned mustard and we’re done with those! Last, but definitely not the least, we need a ‘Midwest Style’. What better than bacon and cheddar?! Turns out the best way to get bacon bits into the tube is to pour them in, place your hands over each end and shake to even it out. 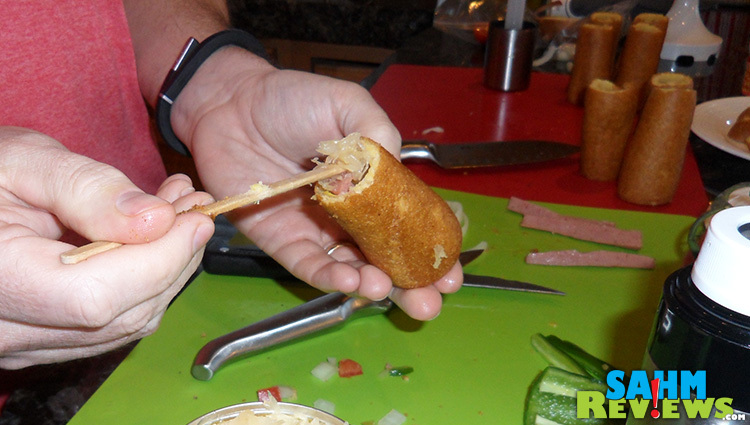 Then pack it down with the aforementioned corn dog stick! you have the perfect ‘rice’ base for sashimi! So was all the effort worth it? The kids LOVED it! This turned out so well that we took tons of photos. Here’s a couple more of the better ones! The Country Ribbon Corn Dogs from our local Sam’s Club worked perfectly for this project. 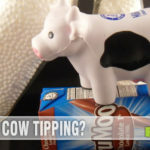 They can be found in the frozen section, and at only about 33 cents each they’re a bargain! You can try them out for yourself next weekend (12/12/13 – 12/13/13) when they offer them during their in-store demos (otherwise known as ‘lunch time’ for those of us on a budget). 😉 Even better, wear your own ‘corny’ holiday shirt or sweater to get yourself in the mood (yeah, I know…old joke). Feel free to share your photos and opinions on their Facebook and Twitter pages, I’m sure they’d love to see you enjoying their products! I love it! So very clever and they look delicious. 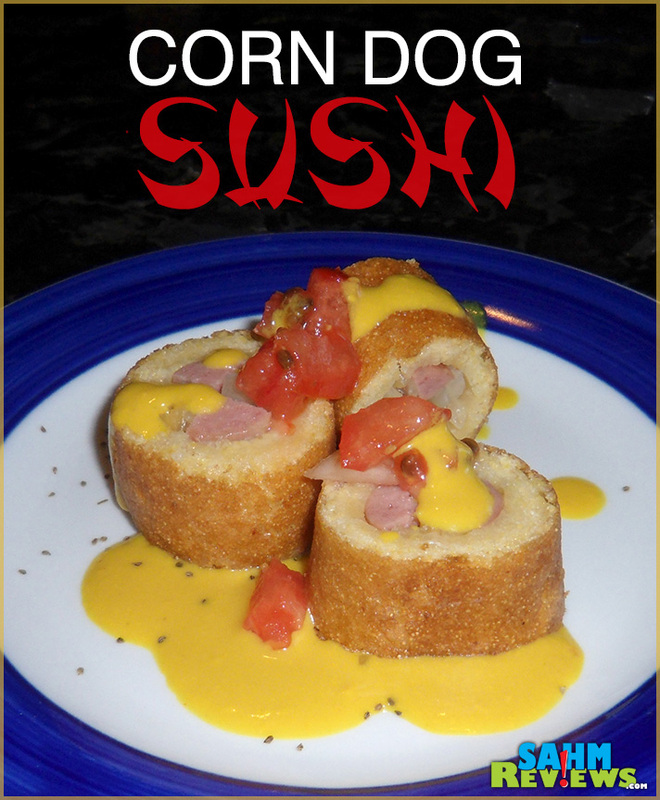 I love corn dogs to begin with but turning them sushi is just brilliant. I love this. What a neat idea. I haven’t had a corn dog in years! 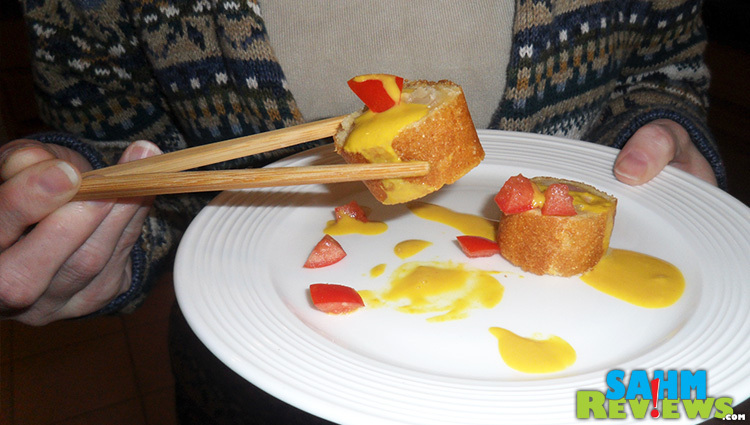 OMgoodness…I love the idea and presentation of your sushi corn dogs – so creative and colorful! Thats pretty clever. Might have to give it a shot here. Thanks for sharing! My daughter loves corn dogs. 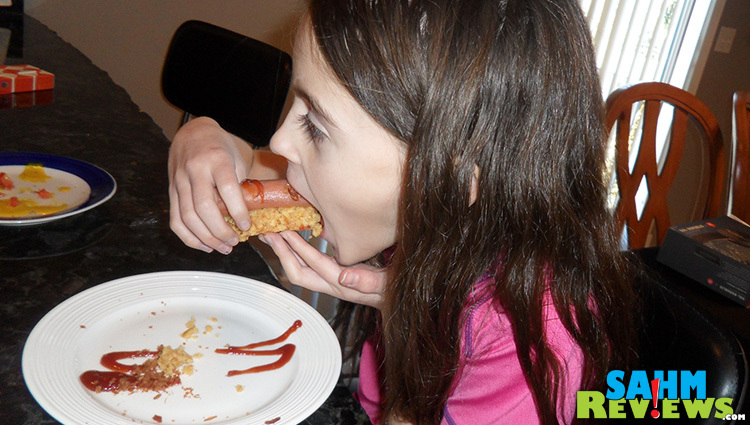 And this sushi style corn dog will click on her, too. That is such a cute idea. My nephew would love that! Such a cute idea! Looks like you guys had fun! Wow – that’s awesome! I love fun food like this. 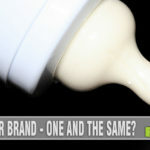 What a creative way to get your children to try something different! My son has a very discerning palate, I wonder if I could convince him to give this a try?! That is just plain awesome! Great idea! Thanks so much for linking this up to the Friday Frenzy – hope to see you again tomorrow! What a fantastic idea! My boys loved corn dogs when we visited the USA last year; if only they sold them here in the UK 🙁 I like the orange chicken line though 😉 So funny. Now this is a way to get my son to eat all of his dinner. What a fun idea! Forget the kids, my husband and I would be all over those. Great idea! You would never get me to eat that, I’m more a raw fish kinda gal, but my husband would love this. That is just so darn clever and tricky. You guys are goooood. That sounds delicious! I bet I could get my son to eat it, and I want to try it too! That is super creative! it’s great you’re encouraging them to try food from different cultures. And that you had fun with the corn dogs. Now that is really cute and an ingenious way to teach kids about foods from different countries….too bad my kids are much too old for this … grandkids one day? ?have to remember this. I will never look at corn dogs the same! how great was your presentation? I MUST try this. Looks so yummy. 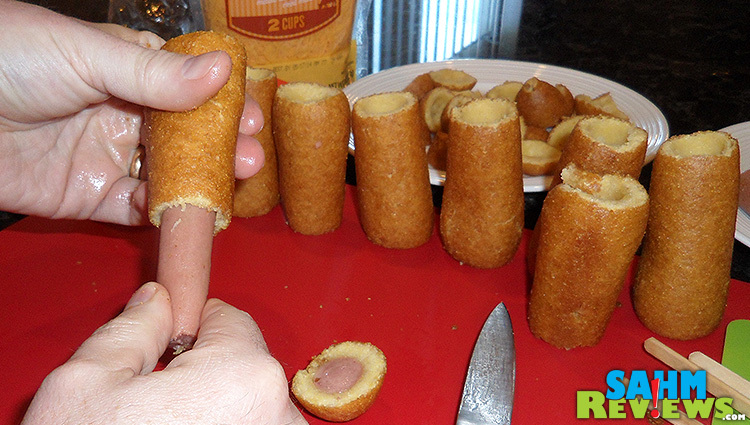 Well that’s a fun way to eat corn dogs. My Hubs loves sushi and he also loves corndogs. I am sure he would like sushi corndogs. They sure did turn out pretty. What a fun idea for the kids. That is the coolest idea I have seen in a while. Look so delicious! This is a very interesting dish. I’m not sure if my boys would eat it because they are picky but I know my husband and I would certainly try it.